Hi again! It’s been nine weeks since I last posted a devblog. I’ve been rather incapacitated in that time. I had a lot of work for the podcast to do, and this kind of bogged me down in various ways… But I think I’m back on track again. Please bear with me through all this text – there are GIF’s and stuff down below! This update is going to be a little different, because I’m not talking about any specific portion of the game. It’s more of a showcase of various things I’ve been working on. Not all the things, just the ones that are easiest (and niftiest) to show off. You may have seen some of these on my Twitter account, but chances are, you haven’t. Tweets kind of get lost in the void, much like the song of a bird sitting amidst a warbling clump of millions other birds, possibly all stuck to a katamari. I’m actually trying to put together a demo for a closed beta test that I hope to run soon. This particular test will only involve a very select group of people. There should be other tests in the future that will involve more people, though. I also intend to release a public demo within a month or two, likely as part of a crowdfunding campaign. About that… On the off-chance that you’ve been following us from the early days of this devblog, you may remember a time when I indicated an expectant release of this summer. That is no longer possible, and in fact has not been possible for a few months now. I didn’t really believe there was much of a reason to say anything more on that matter since I doubt more than a handful of people are even still cognizant of that tentative release date. Basically, the game’s scope changed drastically. The gameplay had to be altered to work properly, and this set off a domino effect which changed the whole game so radically that I could no longer stick to my original work schedule. It would have been possible to release the game by this summer had I kept the gameplay very, very similar to the rogue-ispired platformer I made last year (which I have been using as a base for Arctimicia). However, the result would not have been up to par with my standards, nor would it have properly reflected the nature of the character and the story we want to tell. 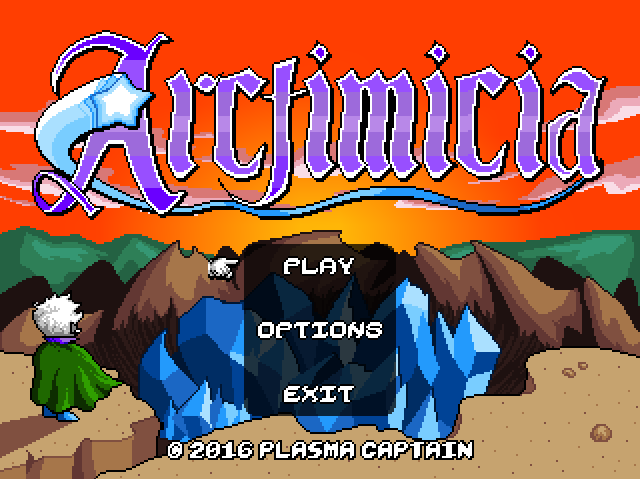 One last note before the pictures begin: The game’s name is, indeed, Arctimicia. We both decided that it’s unique enough on its own to stand alone. There were other ideas, but, in comparison, they felt too confusing, vague, or even silly. Now, on to the pictures and GIF’s. Here’s a static image of the title screen, featuring a pixelated version of the new logo for the game. Selecting “play” pans the screen over to Sarabelle, who awaits the player’s decision. Here you can see some dialogue and options that show up if the player wants to erase a file. Rounding off the menu stuff for this update, here’s the options screen. 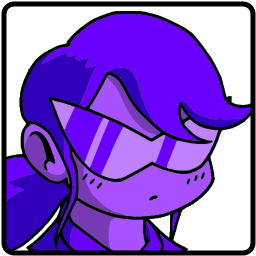 It existed beforehand, but I just cleaned it up and fixed some errors and stuff. I also made it more modular, so it can be called from the main menu, the world map, or even within a level. So, basically, if the player doesn’t like the controls, or other options, they can easily change them without having to practically reset the game. The moving background and general layout is reminiscent of some old Super Famicom games, like those in the Bomberman series. Some time ago, I finally got around to creating a game over animation, as well as fixing up the game over menu itself. Previously, the animation was just a weird, glitchy effect, since it was based off of another game I made. This new animation is very Sailor Moon, I think. I guess it’s kind of like the broken heart logo of Plasma Captain, though that wasn’t intentional. Additionally, Arc reacts more to getting hit by stuff than she did before. There’s a moment where she’s thrown back, just a little. It’s not a big deal. I hate when platformers force your character back several steps and off cliffs and stuff. Though, with that being said, certain kinds of hazards will throw her a lot more. For example, the Wayward Fighter’s sword slash will really knock Arc around! Speaking of batting around opponents, here’s a demonstration of the heavily revised Thunder Wand. Arc can now smack enemies directly with the wand, causing them to animate wildly and fly back a bit. Most enemies are not harmed by this; it’s just a defensive maneuver. It’s pretty fun. This GIF in particular is somewhat mesmerizing, in no small part to the almost seamless loop. I found myself staring into it for minutes at a time on more than one occasion. Lots of other things have been fixed and added here and there. 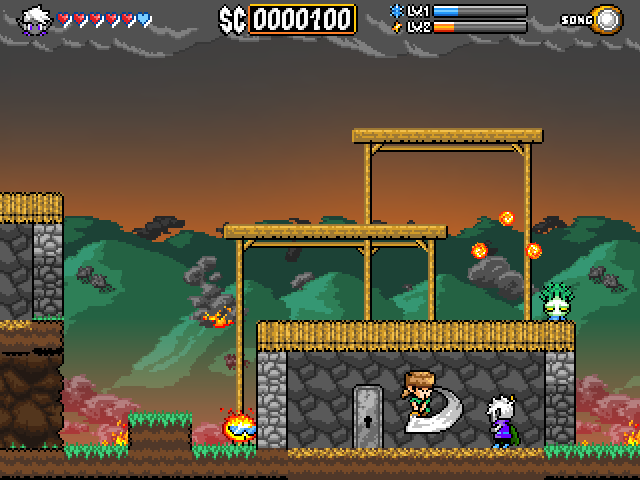 In this screenshot, you can see that the HUD has been changed. Collecting hearts causes the heart containers to refill one-by-one. When XP orbs are collected, they animate now, so the player can more easily tell when they’ve collected them if, say, the orbs spawn right where Arc is standing. These are little things that seem insignificant at first, but you have to think about them when you’re developing a game. It’s more than just polish. Wayward Fighters have been fixed up a lot, too. They have smarter aggro and jumping tactics, a lot of glitches were fixed, and, as mentioned earlier, their sword slashes can send Arc sailing backward, rebounding off of walls and stuff. It’s not something you’ll want to experience firsthand! If you’re interested in the game in any way, please share this (or one of my other articles) with your friends and enemies and frenemies and so forth. It really helps! The world is full of senpais, and we really just want them to notice us.